Bob: Ready to go for a fourth-order multi-step algorithm? Alice: Ready whenever you are! Alice: And these we have to invert, in order to regain the three values for , and , which we can then use in Eq. (72). The only difference is that the inversion is a little harder than it was for getting Eq. (55). Bob: Just a little. Good luck! Alice: Oh, I have to do it again? Well, I guess I sort-of like doing this, up to a point. Bob: And if you dislike it, you certainly dislike it far less than I do. Bob: One down, two to go! You see, now that wasn't that hard, was it? Bob: Not if you do it, no. Keep up the good work! Bob: If you didn't make a mistake anywhere, that is. Alice: I thought it was your job to check whether I was not making any mistake! Bob: I think you didn't make any. But as you so often say, it doesn't hurt to check. Alice: I can't very well argue with myself, can I? Okay, how shall we check things. Doing the same things twice is not the best way to test my calculations, since I may well make the same mistake the second time, too. It would be much better to come up with an independent check. Ah, I see what we can do: in Eq. (73), I can check whether the solutions I just obtained for for , and indeed give us those previous three accelerations back again. In each of those three cases, I'll start off with the right-hand sides of the equation, to see whether I'll get the left-hand side back. Good! Clearly, the expressions in Eqs. (79), (77) and (75) are correct. Phew! And now that that is done . . . what was it again we set out to do? Bob: We were trying to get an expression for the acceleration at time zero, to third order in the time step, expressed in terms of the previous three accelerations. So all we have to do is to plug your results back into Eq. (72). Alice: Ah, yes, it's easy to forget the thread of a story, if you get lost in eliminations. Our fourth-order multi-step method should be called ms4, clearly. I'll use rk4 to rev up the engine, something we'll have to do three times now. And instead of using snap and crackle out-of-the-box, so to speak, I'll use them with the appropriate factors of the time step, and , respectively. Alice: That's not so much longer than ms2, and it still looks neat and orderly! 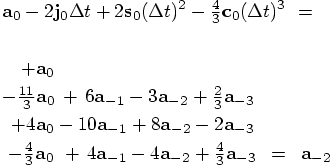 And wait, you have used the division method for our Vector class, in dividing by those number like and so on. Bob: That's true! I hadn't even thought about it; it was so natural to do that. What did you say again, when I told you I had added division, together with subtraction, to the Vector class? Alice: I said that I was sure it would come in handy sooner or later. Bob: I guess it was sooner rather than later. Alice: And I see that you have abbreviated the names of the variables somewhat. Instead of @prev_acc for the previous acceleration, you now use @ap1, for the first previous acceleration, I guess. And then, for the yet more previous acceleration before that, you use @ap2, and so on. Bob: Yes. I would have like to write a-2 for but that would be interpreted as a subtraction of the number 2 from the variable a, so I choose @ap2, for a-previous-two. Alice: Time to test ms4. Alice: Congratulations! But this is close to machine accuracy. Can you just double the time step, to check whether the errors get 16 times larger? Bob: There you are! We indeed have a fourth-order multi-step integrator! Alice: Now that everything works, how about trying to apply a corrector loop? In the case of your second-order version, we saw that there was no need to bother doing so, since we convinced ourselves that we just got the leapfrog method back. But that must have been a low-order accident. The fourth-order predictor-corrector version will surely lead to a new algorithm, one that you haven't already implemented in our N-body code. Bob: I bet you're right. Okay, let's do it! 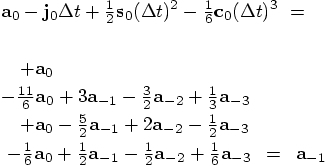 where again and where , , and are the jerk, snap, and crackle as determined from the values of the last four accelerations, which are now , instead of the previous series of four that were used in the prediction step, which were . Note that once more I have interchanged the order of the calculations of the position and velocity: by calculating the corrected value of the velocity first, I am able to use that one in the expression for the corrected value of the position. Bob: And this time I certainly do not recognize these equations. It seems that we really have a new algorithm here. Alice: Let me see whether I can extend your code, to implement this scheme. It would be nice to keep the number of acceleration calculations the same as we had before, doing it only once per time step. After all, when we will generalize this to a true N-body system, it is the calculation of the acceleration that will be most expensive, given that for each particle we will have to loop over all other particles. However, I need to compute the acceleration at the end of the calculation, at the newly predicted position. This means that I then have to remember the value of the acceleration, so that I could reuse it at the beginning of the next time step. This means that I will have to change the variable ap0 to a true instance variable @ap0, so that it will still be there, the next time we enter ms4pc. I will have to initialize @ap0 during the last time we use the rk4 method, so that it is ready to be used when we finally enter the main body of the ms4pc method, as I will call it, to distinguish it from your previous implementation ms4. Bob: The pc stands for predictor-corrector version, I take it. Alice: Indeed. Well, the rest is just a matter of coding up the equations we just wrote out. Of course, in the predictor step, there is no need to compute the predicted velocity. It is only the predicted position that we need in order to obtain the acceleration at the new time, and through that, the jerk. Bob: That ought to work, with a little bit of luck, if we didn't overlook any typos or logopos. Bob: Errors in logic, as opposed to typing. Bob: And it is . . . . a logopo! Alice: And an inscrutable logopo to boot: what does that mean, undefined method `-@' ?!? Just when I grew fond of Ruby, it gives us that kind of message -- just to keep us on our toes, I guess. Bob: Beats me. I know what the method - is, that is just the subtraction method, which I have neatly defined for our Vector class, while I was implementing the second-order version of our series of multi-step integrators. I have no idea as to what the method -@ could possibly be. But let us look at the code first, maybe that will tell us something. I'll scrutinize all the minus signs, to see whether we can find a clue there. The middle part of the method ms4pc is the same as in the predictor-only method ms4, and that one did not give any errors. So we'll have to look in the last five lines. The first three of those are verbatim copies of the lines above, which were already tested, we the culprit really should lurk somewhere in the last two lines. Hmm, minus sign, last two lines, ahaha! Unary minus!! Alice: Unary minus?? As opposed to a dualistic minus? Bob: As opposed to a binary minus. There are two different meanings of a minus sign, logically speaking: the minus in and the minus in . In the first example, the minus indicates that you are subtracting two numbers. You could write that operation as . In the second example, you are dealing only with one number, and you take the negative value of that number. You could write that as . Alice: A binary minus, hey? I'm getting more and more confused with all those different things that are called binaries. In astronomy we call double stars binaries, in computer science they use binary trees in data structures, and binary notation for the ones and zeros in a register, and we talk about binary data as opposed to ASCII data, and now even a lowly minus can become a binary. Oh well, I guess each use has its own logic. Bob: And many things in the universe come in pairs. was a unary minus. All very logical. And yes, while we had defined a binary minus before, we had not yet defined a unary minus. Bob: So you committed a logopo. Alice: And I could correct my logopo by writing jdt/(-2.0) instead of -jdt/2.0. However, I don't like to do that, it looks quite ugly. Bob: The alternative is to add a unary minus to our Vector class. Alice: I would like that much better! How do you do that? Bob: Judging from the error message, Ruby seems to use the convention that -@ stands for unary minus. But just to make sure, let me look at the manual. Just a moment . . .
Alice: I see, just in case you write something like r_new = +r_old. Bob: Exactly. No need to do so, but also no need to let that give you an error message if you do. Alice: Do you think that your one-liner will work? Even better, by a factor of about twenty this time. Great! I now feel I understand the idea of predictor-corrector schemes. We're building up a good laboratory for exploring algorithms! Bob: Yes, I've never been able to plug and play so rapidly with different integration schemes. Using a scripting language like Ruby definitely has its advantages.